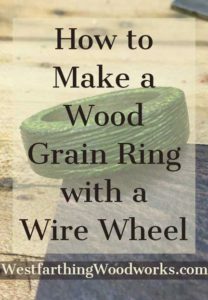 This is How to Make a Wood Grain Ring with a Wire Wheel. 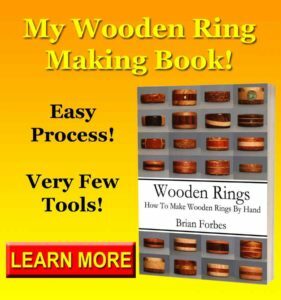 Wooden rings are awesome, and another way to showcase some creative designs is to use a tool to create a grain effect on your rings. I’ll show you exactly how to do it right here, so enjoy. Texture in wooden rings is very important. With so many smooth rings in the world, you can use texture to set your rings apart. Wood grain texture is just one type, but for wooden rings, it’s very fitting. Also, the texture is so easy to apply that you can fully texture a ring in a matter of a few minutes or less. The finishing process afterwards is the same, and you end up with a ring that has an awesome look. Also, sanding is much easier too. Since you are destroying the surface and adding wood grain texture, you don’t need to sand as thoroughly as normal. All you need to do is get the basic shape, and you are all done. That’s a huge win, and a big time saver. 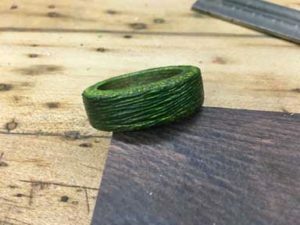 The single easiest way to make wood grain texture on a ring is to use a wire wheel. You can buy these wheels on Amazon, and you can also find them locally in hardware stores and home improvement stores. The type of bristles, the density, and the speed at which you turn them will all make a difference in your texture. 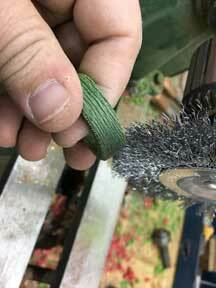 I recommend a steel bristle wheel that is not too dense, and that you turn at your normal lathe speed. This way, you get a constant baseline for the tool, and you can start learning the easiest way right in the beginning. Don’t play with several wheels yet until you get the hang of the first one. The process is easy, but it’s still easier to work one at a time. Dense bristles will not create as deep or separated of a grain pattern. Wide and loose bristles will create a deeper and more separated pattern. Harder metals will remove material more quickly than softer metals. High speed will remove material quickly, but sometimes not as deeply. High pressure will remove material more deeply, but it can go too far sometimes. Softer woods erode mush faster than harder woods. Amazon has a great selection of wire wheels. All you need to turn them is a chuck on your lathe headstock, or a drill press. You can even use a hand drill of you want to, and clamp it to the bench while you work. This is one of the best wheels, and it works perfectly for ring makers. 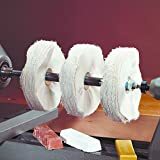 These wheels are high quality, and they will let you apply a wood grain texture very easily to any of your wooden rings. These are the same wheels that I use, and you will be very happy with the results. While you are there, make sure you get some glasses. These wheels will throw off a piece of wire once in a while. It’s the nature of wire wheels. They all do it. When it happens, it can blind you with a direct hit. Don’t become a walking cautionary tale. Wear the right personal protective equipment, and make sure that you are always safe around your tools. This is the easiest thing you will ever do to one of your rings. All you need to do is get the wheel chucked and turning. 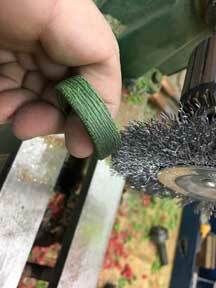 Then, you bring your ring in contact with the spinning bristles and rotate it. Rotate the ring, and make contact as you do. You will notice right away that the speed at which you rotate, and the pressure you use makes a difference in the pattern that the bristles create. You will also notice that the softer areas of the edge grain erode faster than the harder end grain. This is all part of the learning process, and you will figure out a lot in your first round. Take it all in, and really see what the spinning wire wheel can do. Start with the outside wall of the ring, which is the part that you see on your hand when you wear the ring. This is the biggest panel, and the easiest to start with. Make contact, and slowly turn the ring. As you do, notice how the material is removed. If there was not much taken away, and it was more sanded than anything else, try moving the ring slower and applying a little more pressure. Adjust your speed, pressure, and time against the spinning bristles to create the look you desire. The slower and the more pressure, the deeper and more separated the look. In contrast, faster and light pressure will create a shallower look. After the big surfaces are done, switch to the sides and blend in the pattern. In order to create your own look, you will need to practice. That’s the only way to get really good at applying a wood grain texture. Thankfully, there are so many looks you can accomplish, it will beg you to practice because it’s so much fun. Keep on working at your personal patterns and designs. These are how you make your rings stand out from the thousands of other ring makers in the world. The more you work with the wheel, the more ideas you will have, and the more designs you can produce with the same tool. 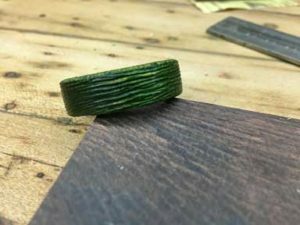 The finishing process for a wooden ring with texture is largely the same for a wooden ring without texture. If your ruts are really deep, you might need to look at another method, but in general it should go about the same. For my rings, I buff them. This allows me to apply the finshed look in seconds, and without having to wait for anything to dry. All I do is work the ring against the turning buffing wheel, and in seconds they shine like they have a fresh coat of finish. If you want to try the same system, you can give the Beall Buffing System a shot and you will see what I mean. I recommend using the system that attaches to the lathe if you have one, because it will save you money. However, if you have a small motor laying around with the right arbor, you can get the other version and set it up as a full time buffer. That’s how mine is, but I had a 3/4hp swamp cooler motor with the right shaft already, so I used it. Your assignment is to try a wood grain texture on one of your wooden rings. All you need is the wire wheel, and you can literally apply a world class texture in seconds that you will love every time. Not only is this a killer look, but it also saves you a lot of time spent sanding. Since the wire wheel obliterates the surface, you don’t need to sand it down to a very fine grit before you start texturing. This can save quite a bit of time on each ring. Also, you can create so many different looks with the same tool that you should really give it a try. You will like it, I promise. 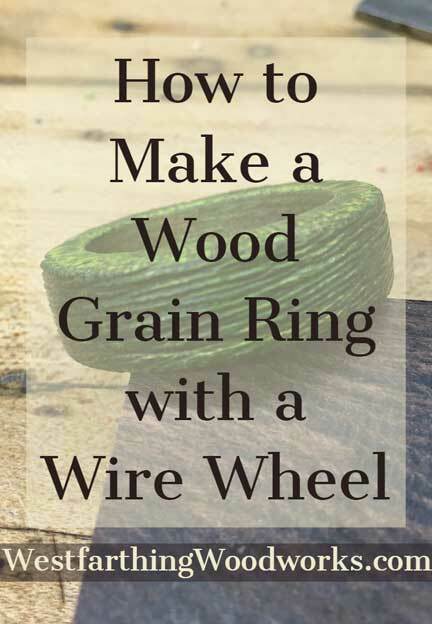 If you have any questions on How to Make a Wood Grain Ring with a Wire Wheel, please leave a comment and I will be glad to answer them. Happy building.